WASHINGTON — The flight simulator and hard drives that the pilots of Flight 370 had at their homes appear to be a dead end, yielding few clues that shed any light on whether they deliberately diverted the missing jet, according to two people briefed on the investigation. (CNN) -- Search teams shifted to a different part of the Indian Ocean Friday in their hunt for the missing Malaysia Airlines plane after "a new credible lead," authorities said. 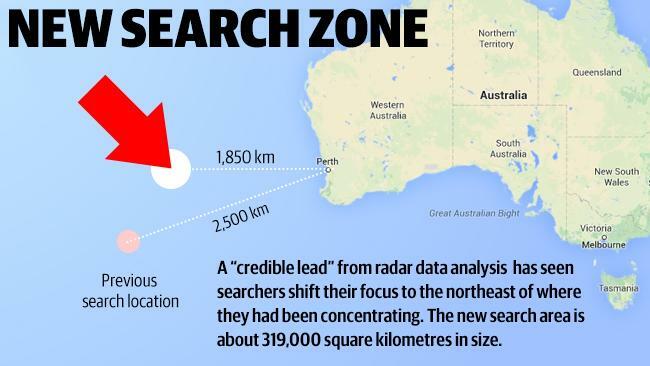 An analysis of radar data led investigators to move the search to an area 1,100 kilometers (680 miles) to the northeast, the Australian Maritime Safety Authority said, calling the new information "the most credible lead to where debris may be located." "It indicated that the aircraft was traveling faster than previously estimated, resulting in increased fuel usage and reducing the possible distance the aircraft traveled south into the Indian Ocean," the authority said in a statement. The renewed search for Flight 370 in the southern Indian Ocean comes a day after Japan and Thailand both said they'd sent new satellite images to Malaysia showing separate debris fields that could be related to the plane, which vanished March 8 with 239 people aboard. Analysts said the search area shift could be a sign that investigators are closing in on the missing plane's whereabouts. "With this development, perhaps they're able to hone in on the more accurate altitude," said Mary Schiavo, a CNN aviation analyst and former inspector general for the U.S. Department of Transportation. That, experts said, could bring investigators closer to determining what happened aboard the plane, what caused it to veer off course and where it ended up. You know you've entered a strange place with #MH370 coverage when each day is played out like an alternate ending to Clue. More ships are on their way to join a Chinese vessel hunting for objects spotted by aircraft that may be debris from missing Malaysia Airlines Flight 370. CHERAS, Malaysia—Investigators have found no evidence that a member of the crew or a passenger was responsible for the disappearance of Flight 370 three weeks ago, Malaysian Home Minister Ahmad Zahid Hamidi said Saturday. Still, investigators have not ruled out any possible cause and continue to investigate whether the disappearance was the result of hijacking, sabotage or terrorism or whether someone on the plane faced psychological or personal problems, he said. “We cannot zero in on any faults by passengers or crew members, so we are focusing into getting more value-added information in order to strengthen our investigative findings,” he said during an event at the Malaysian Police Academy in Cheras, a suburb of Kuala Lumpur. Police have conducted more than 100 interviews, he said, adding that he would not reveal any details of the findings until the probe is completed. The home minister also said that the FBI had informed the Malaysian government that it “did not find anything suspicious” on the flight simulator or home computer of Capt. Zaharie Ahmed Shah, the pilot of the missing plane. After investigators discovered that some files had been deleted from the devices, the FBI took the simulator and computer system to the U.S. for a more thorough analysis. Apologies, previous statement on #MH370 should read "1,850 kilometres WEST of Perth." not east. SYDNEY—Aircraft and ships hunting for Malaysia Airlines Flight 370 faced old problems in a new area of the southern Indian Ocean—from poor weather to floating garbage. What they didn’t get was a breakthrough in a mystery entering its fourth week. Multiple sightings of objects floating in the ocean by Chinese, Australian and New Zealand aircraft raised hopes that authorities had made the right call on Friday to shift the search around 700 miles northeast of a previous zone because of new calculations of radar data. But items fished out of the water turned out to be unrelated to the Boeing 777-200 plane, which disappeared on March 8. Australian authorities are continuing to add aircraft and ships to the search operation, counting a Malaysian Air Force C-130 Hercules plane for the first time among nine aircraft that scoured the sea around 1,850 kilometers (1,150 miles) west of the Western Australian capital of Perth on Sunday. An Australian vessel equipped with devices that can find black-box flight recorders beneath thousands of meters of water is readying to leave Perth on Monday, although it will be some days before it reaches the search zone. Malaysian investigators believe Flight 370 crashed in the southern Indian Ocean when it ran out of fuel on March 8, thousands of kilometers from the nearest airport. All of the 239 passengers and crew are assumed dead. Authorities are under pressure to make a breakthrough after several false leads, and amid rising anger among families of passengers on board Flight 370. Dozens of Chinese family members, fed up with the amount of information they are getting from officials in Beijing about the fate of the missing plane, flew to Kuala Lumpur on Sunday in the hope of getting satisfactory answers from Malaysian authorities. Separately, Australian Prime Minister Tony Abbott put a former chief of the defense force in charge of a new body that would act as a bridgehead for families of passengers seeking to travel to Australia if plane debris is found. The Joint Agency Coordination Centre aims to offer visa services, counseling and other help to families. 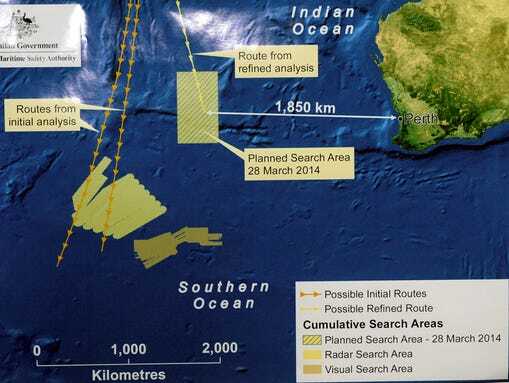 The size of the new search area in the southern Indian Ocean is around 319,000 square kilometers (123,167 square miles), roughly four times as large as the area searched on Thursday, just before Malaysian officials used radar data to conclude they had been looking for the plane in the wrong place. Erik van Sebille, an oceanographer at the University of New South Wales, said the new search area is a “garbage patch” that contains much more flotsam than in the swath of the southern Indian Ocean previously searched. “The chances of a piece of spotted debris being from the plane is quite low,” he said. Underscoring the challenges for searchers, a New Zealand P-3K2 Orion aircraft sighted 70 pieces of debris during a single sortie on Saturday. However, Air Vice-Marshal Kevin Short, of the Royal New Zealand Air Force, said most weren’t of interest to the search. The search has become a race to detect signals from Flight 370’s black-box flight recorders before the batteries in their underwater locator beacon run out. Authorities calculate that they have seven days, or thereabouts, to find the black boxes. That could mark a turning point in the search effort, they say, which would become immensely more difficult. An Australian vessel carrying specialist equipment provided by the U.S. Navy that can find black boxes deep below the surface of the ocean is set to leave Perth on Monday. 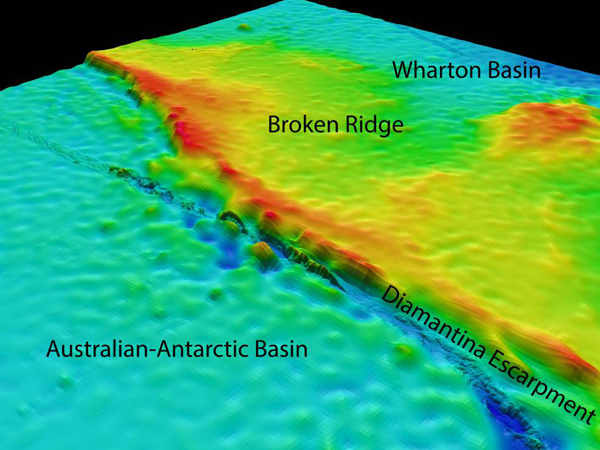 Water depths in the search zone range from 2,000 meters (6,562 feet) to 4,000 meters.</p><p>Bill Fry, a safety adviser and Boeing 737 captain at Express Freighters Australia, said that if search teams can find the black boxes, then it is very likely that they will find most of the missing plane nearby. Heavy components such as the undercarriage and engines aren’t likely to drift far, whereas more-buoyant components may be carried further away from the impact site due to ocean currents, he said. The ADV Ocean Shield, owned by the Australian Navy, has been fitted with a black-box locator, a device that is able to detect pings from the flight recorder. The vessel has also been loaded with a remote-controlled vehicle called Bluefin-21 that can scour the ocean depths for the missing plane. Both devices have a limited search ability. The Towed Pinger Locator-25, or TPL-25, supplied by the U.S. Navy, is able to detect sounds only within a one-mile radius. The locator has to be towed at three nautical miles an hour, or knots, to work effectively, meaning it is restricted to searching about 150 square miles of ocean a day. Bluefin-21 uses sonar technology to search across a preprogrammed area of water, but is only capable of mapping about 40 square miles of ocean floor a day with a high degree of accuracy. “The search area remains vast and this equipment can only be effectively employed when there is a high probability that the final location of Flight 370 is better known,” said Commodore Peter Leavy, Australian commander of Joint Taskforce 658, which is coordinating the military response to find the missing plane. That means investigators may have to draw early conclusions on what fate befell Flight 370 from objects plucked from the water by the multinational flotilla of ships, if they can be definitively identified as plane debris. –Josh Chin and Lilian Lin in China and Rebecca Howard in Wellington, New Zealand contributed to this article. SYDNEY—Australian Prime Minister Tony Abbott, whose country is leading the search for Malaysia Airlines 3786.KU 0.00% Flight 370, said Monday the multinational operation would continue indefinitely as it enters a fourth week without a breakthrough. "We'll keep searching for some time to come. The intensity of our search and the magnitude of our operations is increasing, not decreasing," Mr. Abbott said on Monday, adding that the search was "well short" of the point at which it could be called off if nothing of substance was found. "If this mystery is solvable, we'll solve it. But I don't want to underestimate just how difficult it is." 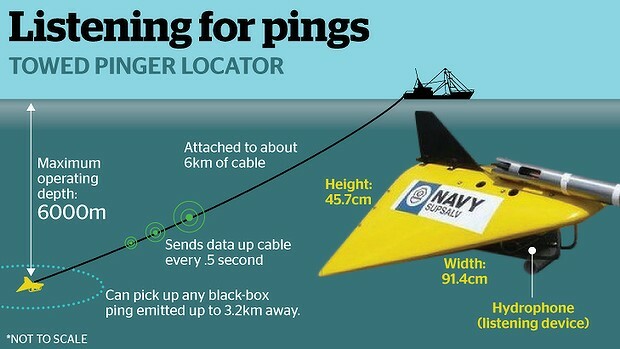 Highlighting the enormity of the task, Captain Matthews revealed that the ''towed pinger locator'' can detect emissions from the black box only if it is within about 1.6 kilometres of its beacon. And it must be towed at a snail-like 5km/h to be effective. Australian Defence Vessel Ocean Shield will conduct sea trials in Cockburn Sound this afternoon to test search equipment loaded yesterday. Malaysia Airlines has reviewed security procedures following the disappearance of MH370 and will now insist that an extra crew member steps inside the cockpit if one of a plane's two pilots takes a lavatory break. As the multinational search for the Boeing 777 in the Indian Ocean failed to produce evidence of debris, the airline confirmed it had introduced stricter measures for pilots in the week after its plane went missing on March 8. The rules, which follow measures to tighten security at Malaysian airports, reportedly require crew members to enter the cockpit whenever a pilot is alone and to stand guard at the cockpit door when it is opened during service of food. A spokeswoman told The Telegraph the airline had "increased security and enhanced monitoring procedures on-board all our aircraft" but said the details could not be released. Malaysian authorities would not confirm today the wording of the final send-off from the cockpit of MH370 but insisted it was not “sinister”. The government initially indicated that the co-pilot’s send-off was “all right, good night”, but the wording in a transcript given to Chinese families was “good night Malaysian 370”. I spoke to an official source who said the send-off was “a red herring”. The source said there was nothing strange about the send-off but investigators still believe the disabling of the communications and plane’s strange route were done deliberately. 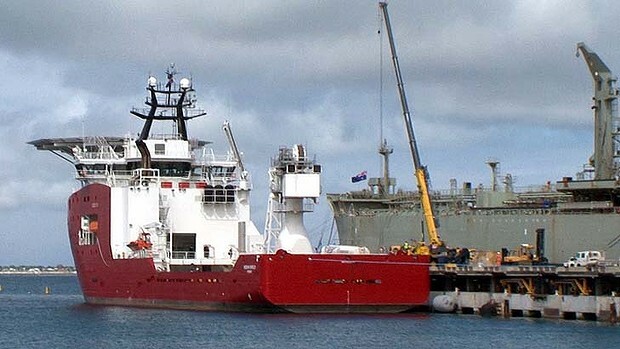 ADV Ocean Shield has departed for #MH370 search area - transit expected to take several days. #MH370 search operations have concluded for today. All aircraft returning, nothing significant to report. Search will resume tomorrow. Malaysian Guided Missile Frigate, KD Lekiu has arrived at HMAS Stirling to receive briefings on #MH370 search operations west of Perth. Malaysia’s defense minister plans to meet with U.S. Defense Secretary Chuck Hagel and other allies in Hawaii this week and seek more assets to use in the search for Malaysia Airlines Flight 370. A multinational team is currently scouring a remote section of the Indian Ocean for the plane that disappeared March 8 during a flight from Kuala Lumpur to Beijing. Authorities have only a few days before the battery that powers the jet’s voice and data recorders’ beacon runs out, which will make finding them underwater far more complicated. “I shall be discussing with the United States, and our other friends and allies, how best we can acquire the assets needed for possible deep-sea search and recovery,” Malaysian Defense Minister Hishammuddin Hussein said Monday at a news briefing. Defense ministers from the Association of Southeast Asian Nations will meet at U.S. Pacific Command in Hawaii beginning Tuesday. Mr. Hishammuddin said he will raise the subject of Flight 370 during the three-day meeting. “I will also use this opportunity to discuss the possibility of deploying more specific military assets, in the event that we need to embark on a more complex phase of the operation,” Mr. Hishammuddin said. Search efforts have so far yielded little. Mr. Hishammuddin said all debris retrieved from the ocean by an Australian-led operation turned out to be unrelated to Flight 370. Ten aircraft and 11 ships were deployed in the search area Monday. The ADV Ocean Shield, fitted with a towed pinger locator to detect the recorders as well as an underwater vehicle, is scheduled to arrive on the scene Thursday. Officials have revised the account of the last words that came from the cockpit of Malaysia Airlines Flight 370 — the latest about-face in the ever-shifting investigation into the jet's disappearance. The Malaysian Department of Civil Aviation said Monday that the last communication with the air traffic controller was "Good night, Malaysian three seven zero." Weeks earlier, officials reported the last words were: "Alright, good night." Authorities also said they are still conducting a forensic investigation to determine who was talking — even though the airline's chief executive said two weeks ago that it appeared the co-pilot was the speaker. Since the flight vanished March 8 en route to Beijing from Kuala Lumpu with 239 people on board, the investigation into what happened has been beset by false leads and conflicting information. On Monday, Malaysia's Transport Ministry said the final voice transmission from the cockpit of Flight 370 was "Good night Malaysian three seven zero." That's a departure from earlier language in which Malaysian authorities said the final transmission was "All right, goodnight." The new language is routine and is not a sign of anything untoward occurring aboard the flight, said CNN aviation analyst Mary Schiavo. But she said it does raise questions about how Malaysian officials have handled the investigation. "Well, it speaks to credibility issues, unfortunately," she said. A Cook County judge has thrown out the first court action filed in connection with the missing Malaysia Airlines passenger jet, calling the filing improper and threatening to impose sanctions against a Chicago-based law firm that has been accused of questionable tactics in the wake of aviation disasters. Without solid evidence of a crash or wreckage of the jet, Ribbeck Law Chartered said in a petition filed last week that the Beijing-bound Flight 370 had experienced a catastrophic mechanical failure before plunging into the southern Indian Ocean, killing all 239 passengers and crew on board. The petition named Malaysia Airlines and Chicago-based Boeing as defendants and sought to preserve evidence in the case and to identify anyone involved in the plane's manufacture and upkeep. But in dismissing the action, Judge Kathy Flanagan, who oversees all airline-related suits filed in Cook County Circuit Court, said in a four-page ruling filed late Friday that the law allows such filings only when the identity of potential defendants is unknown. Page created in 10.249 seconds with 19 queries.